The lives of two well known Delano farmers were snuffed out last Thursday… | "Ever Widening Circle"
Two Delano Farmers, Robert Smith and Emmett Griffith, Have fatal Accident With Dynamite as a result of a premature explosion of 20 sticks of dynamite, the lives of two well known Delano farmers were snuffed out last Thursday. Emmett Griffith and Robert Smith were lowing stumps and had set down on a log to rest a moment. Near them was a pail containing 20 sticks of dynamite, a quantity of dynamite caps and fuse. They both were smoking and the supposition is that a spark from one of their pipes fell into the pail and caused the explosion which occurred a few minutes after they had seated themselves. Griffith had both legs blown off near the thigh and was otherwise mangled. He lived for only two to three hours after the accident.Smith had one leg and one arm blown off and suffered other severe injuries. He died about 5:00 o’clock that afternoon. Both men regained consciousness before they died and told the same story as to how the accident occurred. The funerals were held on Saturday and Sunday. 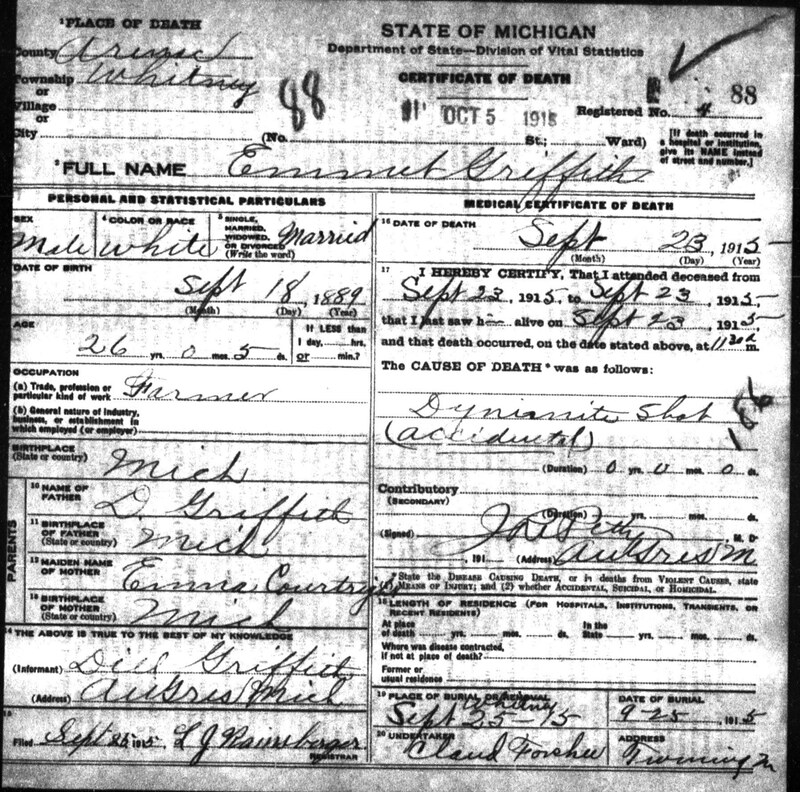 Griffith was 26 years old and leaves a widow and one child. Smith was 19 years old and single. The sympathy of the entire community is extended to the bereaved relatives. Griffith Emmet (P.N.) 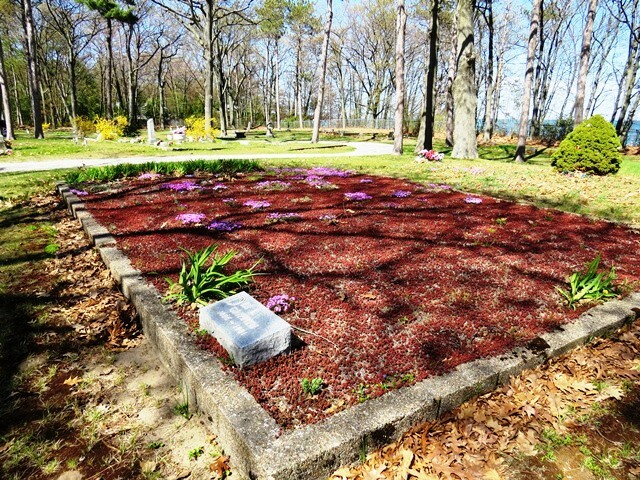 Sept 18, 1889 – Sept. 23, 1915 Ed a Manor, caretakers of Linwood Cemetery in AuGres Township was at the Sim-Whitney Cemetery on the day I was exploring it 5/15/13 – he stated that the Griffith family plot had a body they unburied and placed in a box and buried it back into the ground beside where Dee I Griffith is buried – due to a female family member request – unsure as to the whole story but will try to get him on record as to what happened! 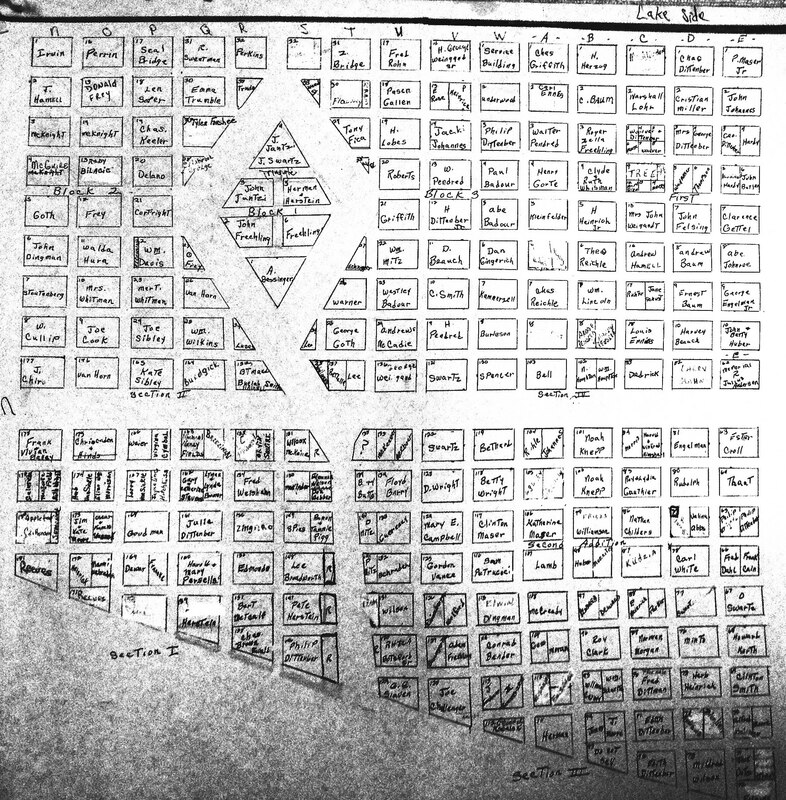 Note: They are looking for help in locating the burial locations of 40 people at the Linwood Cemetery. 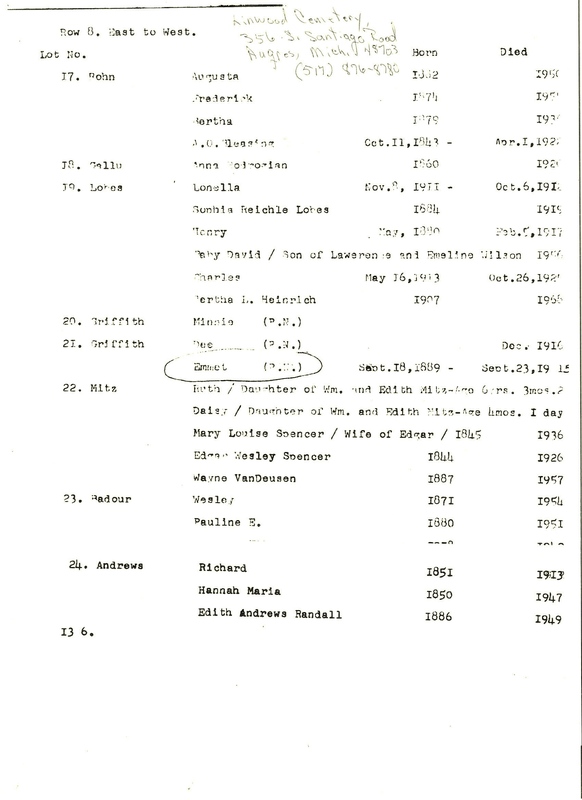 Their records show that there are 40 death certificates that give the burial place as Linwood or AuGres Cemetery. They cannot match these certificates with any of the cemeteries plots.